Poison oak has leaves that look like oak leaves, usually with three leaflets but sometimes up to seven leaflets per leaf group. It grows as a vine or a shrub. Poison oak is more common in the western United States, but it is also found in the eastern United States and, rarely, in the Midwest. Poison sumac has 7 to 13 leaflets per leaf stem. The leaves have smooth edges and pointed tips. Poison sumac grows as a shrub or small tree. It is found in wooded, swampy areas, such as Florida and parts of other southeastern states, and in wet, wooded areas in the northern United States. 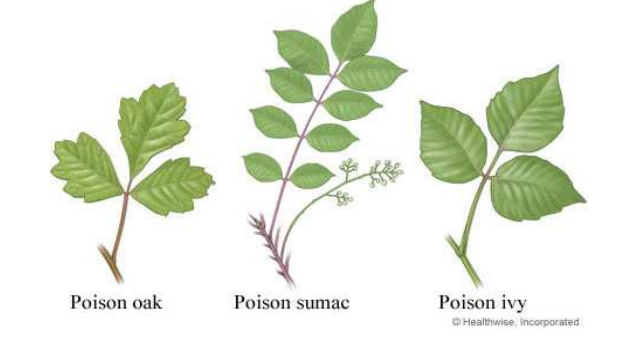 Poison ivy usually has three broad, spoon-shaped leaves or leaflets (“Leaves of three? Let it be!”), but it can have more. It may grow as a climbing or low, spreading vine that sprawls through grass (more common in the eastern United States) or as a shrub (more common in the northern United States, Canada, and the Great Lakes region).